getcalc.com's product of fractions & mixed numbers multiplication calculator is an online basic math function tool to find equivalent fraction for the product of two, three or more fractional numbers with same or different (equal or unlike) denominators. Users may use this calculator to generate complete workout for the given input values to verify or practice the fractions multiplication worksheet problems with step by step calculations. To know or verify the multiplication between two or more fractions, supply the input values to generate the complete workout with step by step calculation to help elementary or grade school students to solve the worksheet or homework problems efficiently. Product of Multiple Fractions is a basic arithmetic operation used to find the product of two, three or more whole numbers, positive and or negative fractions. Multiply any number of fractions with like or unlike denominators, positive and negative fractions, or fractions with whole numbers by using this multiple fractions multiplication formula & calculator. 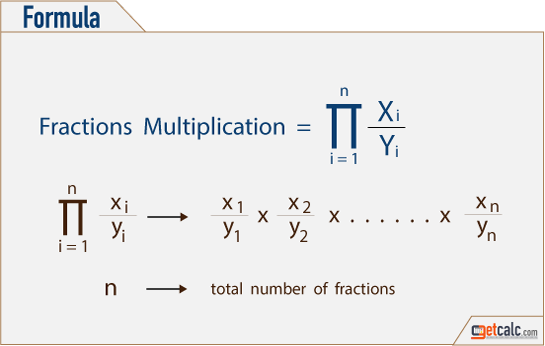 The multiplication for fractions which are having the same or equal denominators is the simplified fraction or the product of numerators divided by the product of denominators. The procedure to find the product is same for fractions with same or different denominators. Users may refer the below solved examples with step by step calculation to learn how to find the equivalent fraction by multiplying two, three or more fraction numbers with same or unlike denominators. How to find product of two, three or more fractions? How to find product of multiple fractions and whole numbers? How to find product of multiple positive & negative fraction numbers? The below solved example with step by step calculation or workout may help users to learn how to find the equivalent fraction by multiplying three fractions with same or different denominators. Problem Find the product of three fractions 1/2, 3/8 & 2/7. Thus, 3/56 is the product of multiplying three fractions 1/2, 3/8 & 2/7. The below solved example with step by step workout may help users to know how to find the equivalent fraction by multiplying multiple fractions (with unlike or different denominators) and whole numbers. Find the product of fractions and whole numbers such as 2/3, 5, 4/7, 1/3 & 9. Thus, 40/7 is the equivalent fraction by multiplying multiple fractions and whole numbers such as 2/3, 5, 4/7, 1/3 & 9. The below solved example with step by step calculation may help users to know how to find the equivalent fraction by multiplying multiple whole numbers, positive & negative fractions (with unlike or different denominators) 1/2, 1/4, -1/3, 7, 1/6, -4 & 2/5. Find the product of positive & negative fractions (with unlike or different denominators) and whole numbers 1/2, 1/4, -1/3, 7, 1/6, -4 & 2/5. 1/2x1/4x-1/3x 7 x1/6x -4 x2/5 = ? If the count of negative numbers is odd, then the result is negative. If the count of negative numbers is even, then the result is positive. Thus, 7/90 is the equivalent fraction by multiplying multiple whole numbers, positive & negative fractions (with unlike or different denominators) 1/2, 1/4, -1/3, 7, 1/6, -4 & 2/5. Find the product of multiple fractions, mixed & whole numbers 1/3, 3/5, 6, 7(4/9), 5(5/6), 4/3. 1/3x3/5x 6 x 74/9x 5 5/6x4/3= ? Thus, 1876/27 is the equivalent fraction by multiplying multiple fractions, mixed & whole numbers 1/3, 3/5, 6, 7(4/9), 5(5/6) & 4/3.